Kirk Hill United church is located in Lochiel 7th Concession lot #27 north side of road. St Columba Presbyterian Church is located in Lochiel 6th concession lot #26 south side of road. added by AWF. With its memorial gates with plaques reading "Chuimhneachen" (Gaelic for - In memory of) and its setting south of the centry-old, MacGillivray property east of Laggan, the Kirk Hill United Church of .Canada is a symbol of local history and rural spirituality. "There . are a lot of things to remember," says Dalkeith native, Alexander MacLeod with a laugh when -asked to describe fond memories of the 150-year-old church. MacLeod can still hear the Gaelic songs, remember the camaraderie of the lawn socials and smell the smoke of the church fire in 1948 when given time to reflect upon his life with the Kirk Hill church. Although MacLeod could not speak Gaelic, the language brought a sense of home because he often heard his mother talking Gaelic with his grandmother. A bilingual minister served at the church until 1922 when Rev. A. Morrison, the last minister to preach in, Gaelic died. MacLeod also remembers the day when he and his father helped Other church members to rescue the seats of the church after a fire broke out in 1948. Madeleine McCrimmon, a life long member of the church shares with MacLeod fond memories of lawn social and musical evenings. "I remember how Havelock and Carlyle Denovan were good musicians," She says. For McCrimmon, the Kirk Hill United Church always remained a place where she could feel close to both her spirituality and her native roots. "It always met my personal needs where religion is concerned." The church was a reminder of McCrimmon's close ties to Glengarry. "My great grandfather worked on the timber used to build the church," she says. membership at the Kirk Hill congregation. "I considered it my home church." And still today, McCrimmon drives to Glengarry every weekend from her residence in Ottawa to attend weekly Sunday morning services. "It's just like a part of you. It's part of your home." She remembers attending church as a child when there were at least 100 members present. Now there are approximately 40 household members. Church member Christina Urquhart says there are about 30 people who gather for the weekly Sunday worship..
Reverend Kate Ballagher-Steeper was the last full-time minister at Kirk Hill. She is now replaced, by Reverend Robbert Pentinga, of Cornwall who works part-time for the congregation. The manse has been up for sale since the early spring. McCrimmon is not saddened or disappointed by the decrease in number of members and the sale of the manse. She said changes are part of every community, even the small rural congregation at Kirk Hill. It's not the first change for the congregation. Founded in 1849, the Lochiel Free Church of Scotland was a result of the disruption of the Presbyterian Church of Scotland. Consequently some members of the congregation left the Lochiel Church of Scotland, known as Church of Scotland, known as St. Columba, to form the Lochiel Free Church of Scotland. 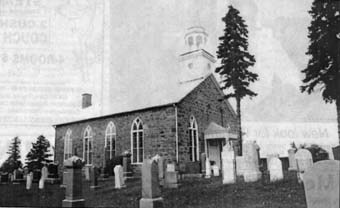 Later in 1859, the church joined the Union Presbyterian Church and became known as the Canada Presbyterian Church. Over 60 years later, the union was extended with the Methodist, Congregational and Presbyterian churches. It became the Kirk Hill United Church which caused some families to return to their ancestor's church, the St. Columba Presbyterian Church. The stone church on the north side of Kirk Hill was built in 1849 when some Presbyterians opted to leave the Lochiel Church of Scotland, commonly known as, St. Columba.